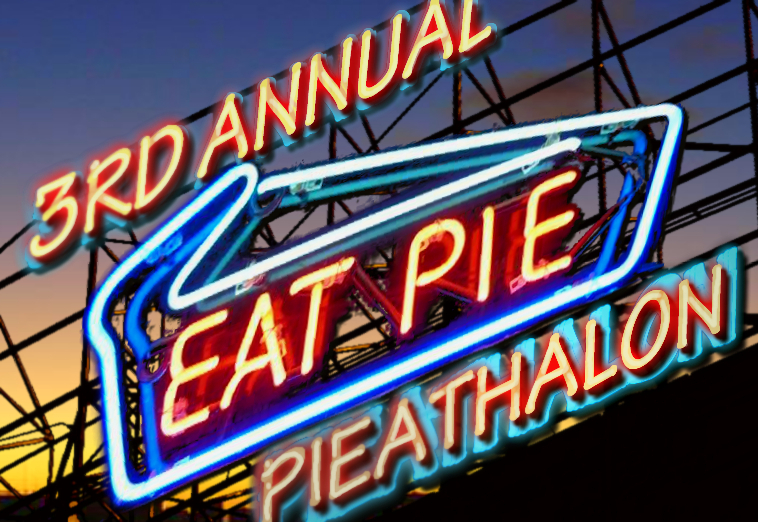 Welcome to the 3rd Annual Pieathalon! Yinzerella of Dinner Is Served 1972 has once again collected retro bloggers and arranged for us all to swap pie recipes with one another. And once again, I see no reason to pass up an opportunity to (a) get a new recipe to test and (b) eat pie. 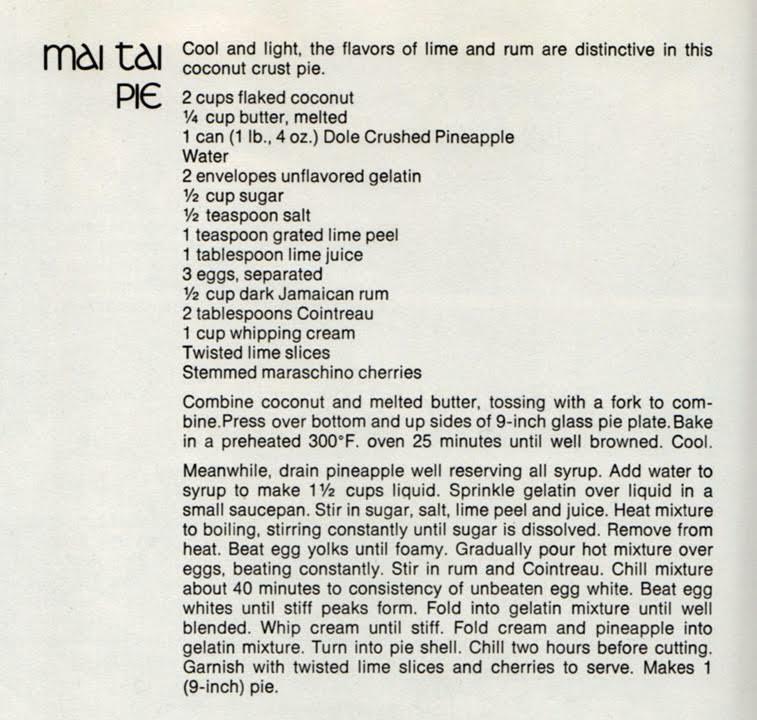 We were randomly selected to make Mai Tai Pie, a recipe from The Thatched Kitchen Harvest & Holiday Cookbook (1972), contributed to the pie pool by Kelly at Velveteen Lounge Kitsch-en. Cool and light, the flavors of lime and rum are distinctive in this coconut crust pie. Combine coconut and melted butter, tossing with a fork to combine. Press over bottom and up sides of 9-inch glass pie plate. Bake in a preheated 300°F. oven 25 minutes until well browned. Cool. Meanwhile, drain pineapple well reserving all syrup. Add water to syrup to make 1 1/2 cups liquid. Sprinkle gelatimn over liquid in a small saucepan. Stir in sugar, salt, lime peel and juice. Heat mixture to boiling, stirring constantly until sugar is dissolved. Remove from heat. Beat egg yolks until foamy. Gradually pour hot mixture over eggs, beating constantly. Stir in rum and Cointreau. Chill mixture about 40 minutes to consistency of unbeaten egg white. Beat egg whites until stiff peaks form. Fold into gelatin mixture until well blended. Whip cream until stiff. Fold cream and pineapple into gelatin mixture. Turn into pie shell. Chill two hours before cutting. Garnish with twisted lime slices and cherries to serve. When I was in the liquor store shopping for Cointreau, I couldn’t find it. I asked the one of the helpful store clerks, who gave me a slightly weird look. My first paranoid thought was, oh no, I’m pronouncing it wrong, and I started to flash back to 8th grade French class, reviewing how all the letters went together, debating whether I should try saying it again, saying it differently, or just grin cheerfully until he said something — when he pointed to the bottle directly to my left, clearly labeled COINTREAU. We were pretty excited to try this. 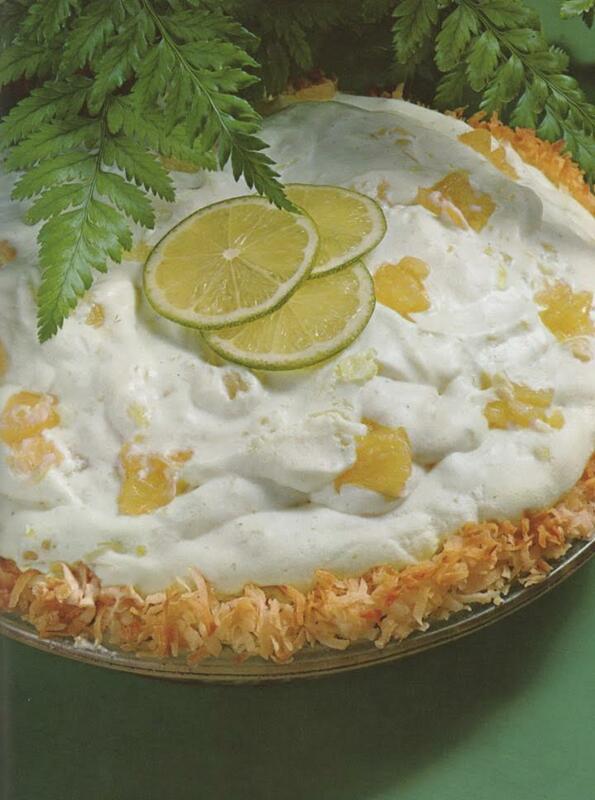 Plenty of booze in the pie, and bright tropical flavors. The crust needed to be put together first, with (yay!) plenty of butter. It baked beautifully golden brown, and then sat aside to cool. Gelatin with plenty of pineapple and lime juice and sugar. At this point, it was tasting pretty darn good. And then we added booze. Whee! I was the most proud of this part. I didn’t just slice up limes for decoration — I candied them! Boil citrus in sugar for fifteen minutes or so, and you get a treat that makes any citrus lover (like me) very happy. Use pasteurized eggs! These don’t get cooked, just whipped and folded in. After chilling and solidifying, it was ready to serve. This is just gorgeous, isn’t it? I’m really proud of those lime slices, and that twist in the middle! Sadly, I was a little less pleased with the flavors. It definitely tastes like a Mai Tai cocktail, with lots of extra cream. But the crust should have been sweeter, and the filling could have been (I can’t believe I’m about to say this) less boozy. It wasn’t a really strong “ooh I’m gonna be drunk” punch, but it did taste more like alcohol than lime or pineapple or even sugar. So this gets a “meh” — but I’m happy enough with it that I’m curious to tweak the recipe and bit and see if I can get those flavors more balanced. But this Pieathalon is still a huge blast, and I’m thrilled to have participated for the third year in a row. For more pie-tastic tastiness, take a look at these other fine bloggers! John The Hedonizer — Fidgety Pie. I’m shuddering at the thought of the crust. I know a lot of people love coconut (and I’m glad it seems okay to you! ), but as far as I’m concerned, that crust is made of pencil shavings mixed with sunblock. I thought the crust was fine, although it wasn’t very interesting. Erica was much less pleased with it. She took to scraping the filling off and leaving the crust lying in the bottom of the pie pan. Mai Tai Pudding just doesn’t rhyme as well, does it? Even though I love coconut, I also love your description! I am so sad that the booze was too much. I was really counting on this one being a good recipe. Oh well! It’s all about the experience. Thank you again for participating in the Pieathalon!!! This definitely looks like a Miley Cyrus recipe. Meaning it’s a tweaker! As you noted, there are some great possibilities with adding sugar to the crust (Question: Did you use Baker’s Angel Flake, it has a higher moisture and sugar content than other brands); also reducing the amount of booze and maybe adding a dash of vanilla or almond. Baker’s would have been a sweeter crust for sure. Your tweaks sound like they could really take this from “not bad” to “my goodness”! I’d try grating fresh coconut. So disappointing that the looks don’t match the flavor…beautiful presentation! The candied limes were a definite stroke of genius! Not boozy enough – ha ha! Your pie looked gorgeous though, and I’m impressed with your candied lime slices. I DO like the idea of a recipe being a Mliey Cyrus “tweaker” – brilliant! Aw, sorry it was a disappointment! It looked pretty! Maybe if you cook the booze a little to get the flavor but loose a little of the alcohol.